We have served and supplied products to many, many customers over the entire twenty plus years we have been in business. We’ve supplied automotive lifts and auto shop equipment to car museums, classic car collectors, gear heads as well as full bore car buffs. We’ve also supplied garage equipment to the typical shade tree mechanic, as well as the professional body shops, auto mechanics, industrial fleet services, military and state and local governments, as well as commercial and corporate entities. Another type of customer that we are gaining popularity with is the popular social media gear heads. These guys have a huge following. Don’t underestimate their influence and reach. TJ Hunt is one such social media influencer. His specialty is modifying popular cars with cool gear and wraps, and posting videos of the process on You Tube. He’s shown some very cool modifications on his You Tube channel, and has posted over 600 videos over the past few years. At the time of this post, he already has over 617,000 subscribers to his YouTube channel. That’s quite impressive! It’s all about expressing yourself through your automobile. Most modifications are very cool, but some modifications may not be to everyone’s liking. But that’s OK.
You can check out the video below that he recently posted of the 2 post lift he purchased from us. It covers the installation of it. Obviously, we don’t recommend climbing on the lift while a car is on it as he does. He gives a shout out to ASEdeals.com around the 4:15 mark of this video. Anybody with this kind of audience is worth making note of, and we did. When TJ needed a new car lift for his garage, he did a lot of research, and took some time before deciding on the right supplier to contact. After doing his research, he knew who to choose. He contacted ASE Deals because of our reputation and our experience. We set him up with our BendPak XPR-10AS-LP two post lift. This is the asymmetric two post lift, with a clear floor, and the popular low profile arms. The low profile arms are popular with the folks who modify their cars to make them lower to the ground. These arms feature a slightly lower pad height, but more importantly, the arms stay at the lower profile further back along the arms, thus allowing you to reach deeper within the framework of the automobile, at those frame jacking points that you may not be able to reach with the standard arms. This car hoist is one of our most popular models because of it’s many features. Not only can it position an auto in an asymmetric setting, but if need be, it can also position the car symmetric. This adds a layer of versatility you can’t find on most lifts out there. Additional popular features include dual width settings, wide or narrow, and it is also available in an extra tall version. It also features screw pad adapters, so you can infinitely adjust the height of the frame contact pads. Contact us today if you would like more details on this, or any other hoist in our product line. We will be sure to fit you with the best model and type for your application, and at the lowest price guaranteed. Plus, we can sell, service, and install anywhere in the USA. Besides his popular You Tube channel, TJ also has a popular Facebook page, as well as a website featuring a product line of gear like Tee shirts and sun glasses, as well as a popular line of car finishing and detailing products, like shampoo , and car polish. He’s quite the young entrepreneur. If you’re into tricking out your cool ride, this channel is for you. This tuner car stuff is for serious car buffs. He has lots of young followers, and we are certain you’ll be hearing much more about him in the future. We recently had the opportunity to visit a true gem in upstate New York. The Rochester Auto Museum is located in downtown Rochester New York, and offers muscle car and classic car fans the ability to view some real classic American cars. 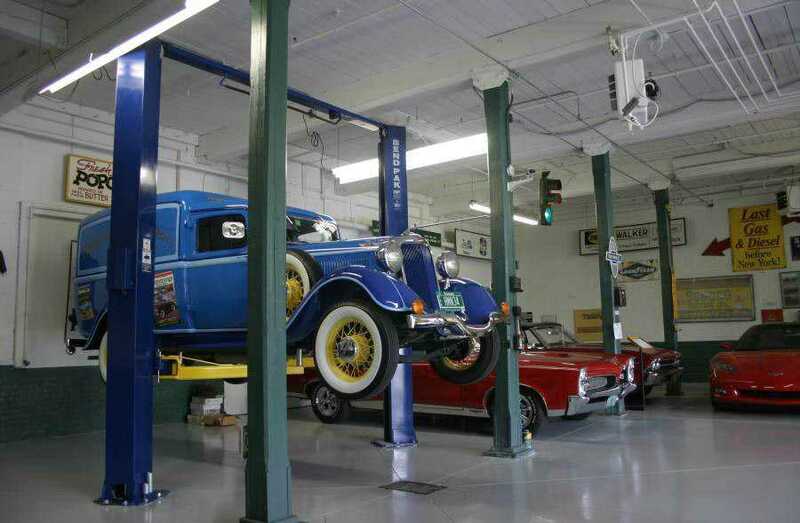 We were fortunate enough to supply them with several of our BendPak HD-9XW 4 post car lifts for storage and for servicing their fine automobiles. The collection of vehicles is always changing, as they buy and sell cars frequently, but there is a common theme among all the autos in the collection – lots of one of a kind, or limited model muscle cars, with lots of Mopar autos sprinkled in. We also had the great pleasure of meeting and becoming friends with Bob Bartosiewicz, the owner. He is an avid car collector, and has a passion for only the finest automobiles, concentrating mainly from the classic era of the late 60’s to early 1970’s. He was such a gracious and generous host, and took the time to inform us of all of the particulars about each vehicle. His passion comes through right away as he describes the features of all the great cars, and we were in awe of the collection. Let’s just say – He knows his stuff! Check out this old classic below. If it looks familiar, it should. It’s the red 1958 Plymouth Fury. One of only 12 that were used in the cult favorite Stephen King movie – Christine. This one was the actual Director’s car. So it is in pristine condition. That’s the owner Bob Bartosiewicz next to her. 1958 Plymouth Fury – The actual car from the movie Christine. Another gem from this amazing collection is the 1971 convertible Plymouth Hemi Cuda dubbed Sno White. This is one of one, and is probably the most valuable automobile of the collection. He just purchased it earlier this year. 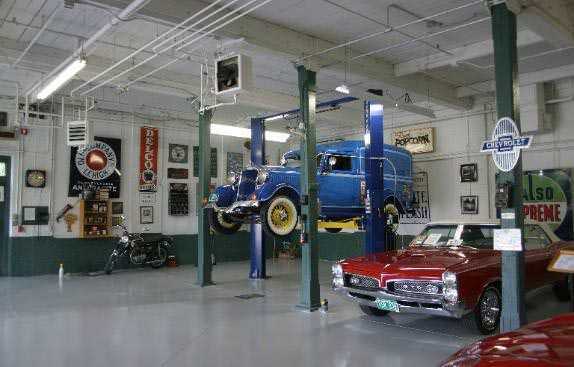 Below you can see several classic vehicles on car lifts. We supplied two BendPak HD-9XW four post lifts to the museum for them to use for both servicing their vehicles, as well as storing one car over another. No car collection like this would be complete without at least one of these vital pieces of shop equipment. Below you can see a panoramic view of the garage. They have 3 beautiful SuperBirds with wings, numerous GTO’s and Cudas, Dodge Challengers and Chargers, Road Runners, Ford Mustangs and much more. This collection must be seen to be believed. This museum is packed full with American muscle, perfect for anybody who appreciates bygone days of true passion for classic car design. The Rochester Auto Museum is located at 140 East Main st. in Rochester, NY and we recommend you call them to schedule an appointment to visit. Phone number is 800-398-3029. The MD-6XP Mid Rise Scissor Lift by BendPak is a hugely popular car lift. As a matter of fact, they are one of our top sellers. And there’s a good reason why too. First of all, it’s portable. You can move it around your shop or garage with ease. It does not have to be bolted to the concrete. It takes up very little floor space. Plus, It offers access to most of the automobile, including the tires, and it’s extremely versatile. It can handle a wide variety of autos. Plus, it is popular not only with the home / do it yourself crowd, but it also is popular with the body shops and brake shops too. The best part? It’s made by BendPak. They are a true leader if the car lift market. And few companies are better at it than them. “I received my lift last month. I am enjoying it. I thought I would send a photo of it in use. I hope you enjoy, I know that I am”. You use your imagination and get the best lift for your needs. There are lots of choices. Check out these pics below. Any gearhead would appreciate viewing these pictures. The first image is of our Dannmar D7 four post lift. This customer purchased 5 of these lifts from us. 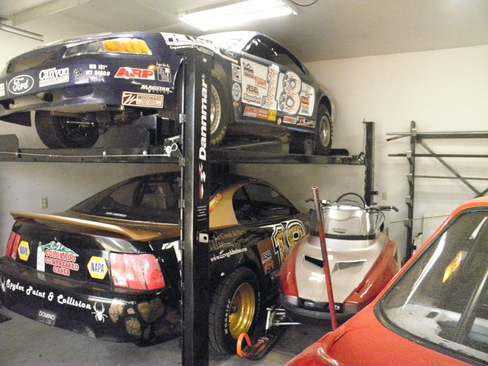 As you can see, it is being used to store one car over another. That is a typical use for this lift. It is extremely popular with our home hobby customers, or anybody looking to free up some valuable garage floor space. But it’s not just a storage lift. It is also a great service lift. We love any pictures we get with racing cars. 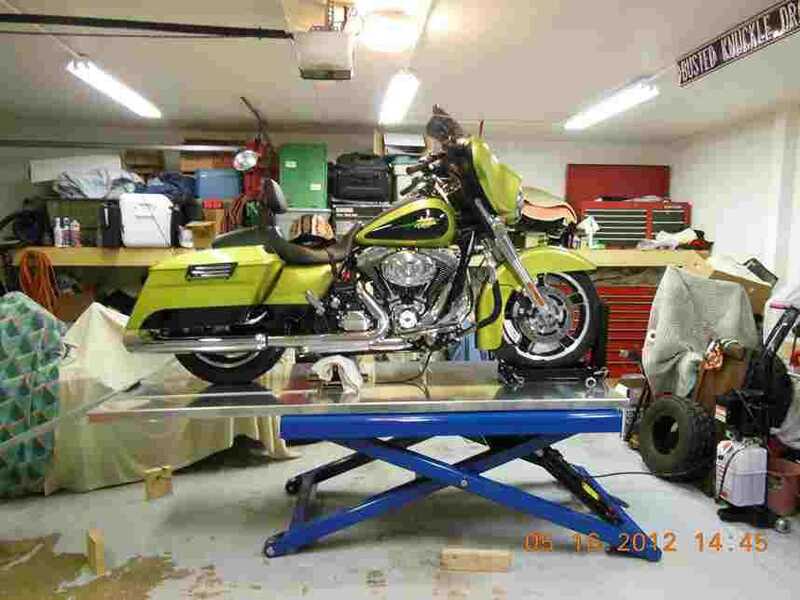 The picture below that is the same customer showing off his BendPak HDSO-14LSX open front, four post alignment lift. This customer has a thriving commercial auto shop and one of the many lifts they purchased from us is this beauty. They also purchased a BendPak two post lift, along with another Bend Pak four post lift. What makes this HDSO-14LSX alignment lift so special? 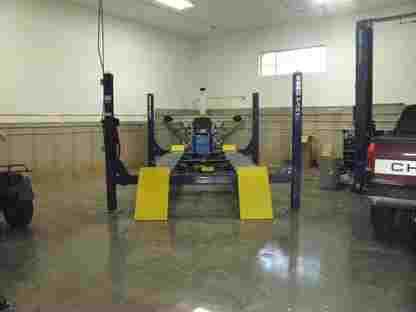 It is a full featured alignment lift by one of the premier lift manufacturers in the business. It offers great features like an open front, meaning there is no cross member, so when the technician wants to get in between the runways to perform work, he won’t need to duck to get there. This means no bumps on the head, as well as a speedier job. We all know this formula – Time = Money. This customer won a car battery jump starter by Booster Pac just for simply submitting his photos. You can too. We run a drawing of all the photos submitted. All you need to do is email the pictures along with your order number, and perhaps a few comments if you like. You need to have purchased the lift within the last year. You will get one entry per each lift. There is no other criteria. It’s that simple. lifts, but also with the service. On top of that, I know I will always get the best deal”.